Dementia affects 1% of the population who are over 60 years of age and 40% of people who are over 85 years of age. Asking about memory problems – do they forget names of friends and family? Can they recall recent events? Assessing activities of daily living – are they having problems working or carrying out everyday tasks. Can they operate phones or technology within the home? Can they make everyday decisions regarding finances or driving a car? Are they able to dress themselves and carry out their own hygiene requirements? Determining risk factors - enquire about cardiovascular and cerebrovascular risk factors, alcohol intake, medications they are taking and if any family members have been diagnosed with a type of dementia. Assessing their gait – do they have gait apraxia or gait ignition failure? Carrying out a thorough cognitive examination and identify deficits - are they able to hold a conversation with ease? Look for the patient using the ‘head-turning sign’ where they look to a care giver to answer a question for them. Testing executive function and see if there are any planning and organizing deficits present. First-line investigations include FBC, ESR and routine chemistry. Consider obtaining thyroid function tests and checking vitamin B12 levels. Investigating sexually transmitted disease possibilities is important, particularly as these are often overlooked in the older generation, but are on the rise in the age group who are more at risk of developing dementia. Second-line investigations to be considered for suspected dementia include CSF beta amyloid and tau proteins, HIV testing, EEG, MRI and Single photon emission computed tomography (SPECT). There is no single test that can conclusively diagnose one type of dementia from another. To diagnose exactly what type of dementia a patient has involves starting with the comprehensive history and physical examination which will identify the patient has a form of dementia. 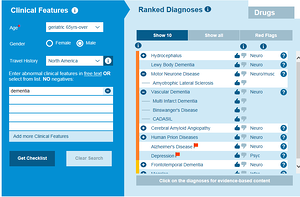 You then need to drill down and examine in detail what symptoms the patient has and identify the type of dementia they have based on clinical diagnosis. Each type of dementia has specific nuances that will help to identify the specific type of diagnosis. A differential diagnosis generator like the Isabel DDx Generator will help you research your patient’s individualized symptoms and drill down your differential. We have outlined some of the most common types and causes of dementia below. This presents with dementia manifesting as changes in thinking and reasoning, confusion, slowness, gait imbalance and other parkinsonian movement symptoms. Patients may also have well-formed visual hallucinations, delusions and sleep disturbances. This commonly presents in elderly patients. If the patient has both dementia symptoms and movement symptoms at the time of diagnosis or if dementia symptoms appear within one year after movement symptoms, then the diagnosis is Lewy body dementia. Lewy body dementia can only be conclusively diagnosed on post mortem so judgement is a clinical one. It should be noted that Lewy bodies can coexist with Alzheimer’s brain changes and it can be hard to distinguish Lewy body dementia from Alzheimer’s disease. This type of dementia occurs in patients over 40 years of age and risk factors include hypertension, smoking and vascular disease. The symptoms of vascular dementia can vary widely depending on the part of the brain which is affected. Clinical features include recurrent stepwise deterioration, pyramidal signs, pseudobulbar palsy, parkinsonism, gait disorder, confusion, disorientation and vision loss. Memory loss may not be a significant feature, as it depends on the specific brain area where blood flow is reduced and, therefore, symptoms vary with the individual. These changes can happen at the same time as physical stroke symptoms of headache, difficulty walking or numbness. They can also occur at the same time as multiple small strokes over a time period, causing a more gradual clinical picture with early symptoms of impaired judgement, inattention and difficulty finding the right words. This is commonly seen in people over 65 years of age. One of the most common early signs is short term memory loss, forgetting events or important dates and repeatedly asking for the same information. There may be changes in the person’s ability to plan and problem solve so early manifestations may include difficulty with keeping track of finances or time. Completing everyday tasks may become difficult, and other symptoms such as misplacing items, poor judgement, difficulty speaking or writing, changes in mood and personality are all signs that Alzheimer’s may be present. Diagnosing a specific type of dementia can be very challenging and it’s important to thoroughly evaluate the patient and rule out infections, depression, and seizures and other causes which are not dementia related and could be causing similar symptoms but are treatable and reversible. 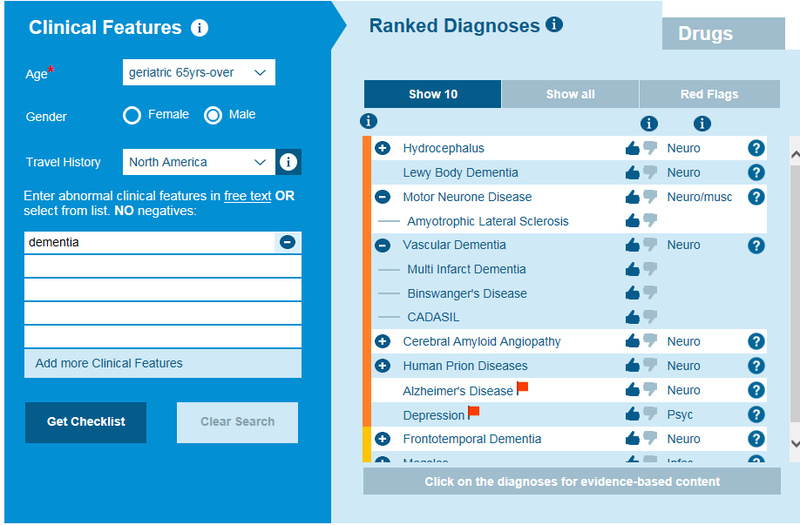 Dementia is a irreversible illness and it’s important to accurately diagnose the specific form of dementia on clinical judgement, using results of examinations and tests conducted and a differential diagnosis. Where possible treatment options can be prescribed to slow down the progression of the illness and enable the patient to maintain the best quality of life for as long as possible.